It is an old cliché that successful schools have involved parents. While the observation may not be original, it is certainly true. Organizations like the PTA and other parent-teacher groups provide the means and opportunities for parents to have an active part in their children’s education. Organizations like the PTA provide a number of services to benefit schools, and they will vary from state to state and school to school. However, the one thing that all the PTA chapters have in common is that they have to have meetings to discuss what they are going to do for the school and to evaluate past efforts. Therefore, they must have meetings. Productive meetings are enjoyable to attend. People with a common goal meet to discuss ideas, share responsibilities and move forward with a plan. It this has three key sections, including objecting, schedule, and role/responsibilities. The Objective section does just what the name implies. The objective can be to discuss an upcoming event, to elect officers or to seek more parental involvement. Having a clear objective helps to prevent the discussion from getting off track, instead of focusing on the upcoming fund-raising event. The next section is the schedule, with a certain amount of time allocated for each topic, such as welcoming the attendees, discussing the main topic and relating issues, taking any necessary votes. A question and answer period will follow with a wrap-up of the meeting. A lot of ground gets covers in about two hours. The final section identifies roles and responsibilities. Having such a section is a good feature because it prevents all the work from falling on the shoulders of one person and can include items keeping minutes, refreshments and other similar matters. 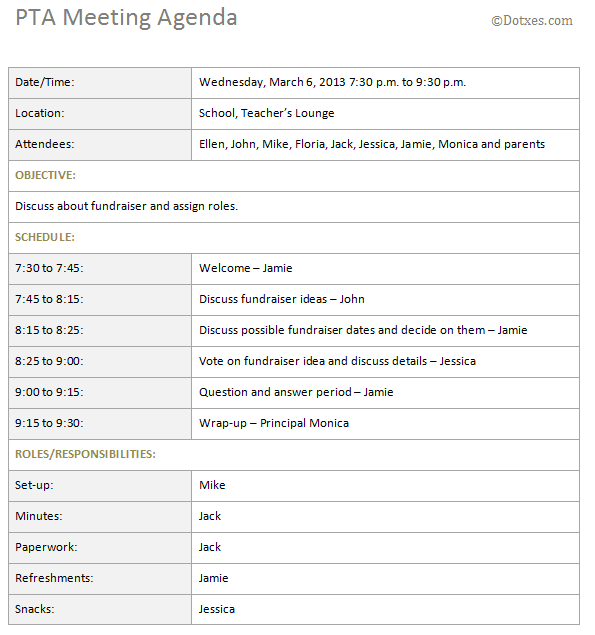 The PTA Meeting Agenda will not guarantee that all gatherings will always run as smoothly as everyone desires. Conflict is sometimes inevitable and can be healthy. However, the template does provide a good plan for seeing that necessary issues are addressed in an orderly fashion. The template may be downloaded from the following site.